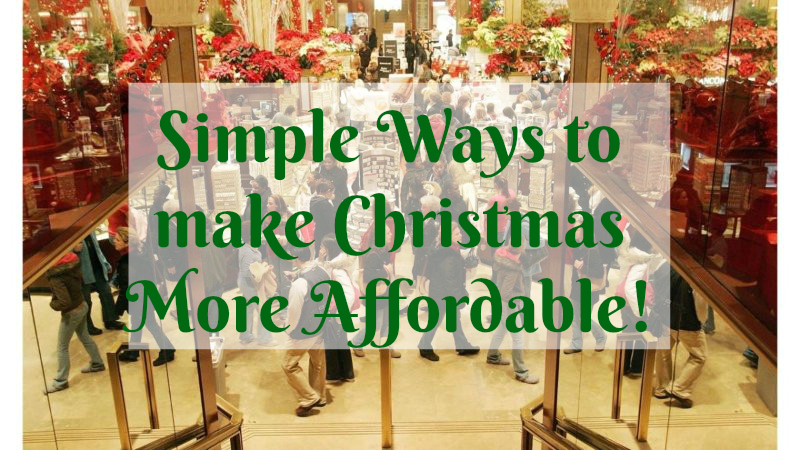 Simple Ways to make Christmas More Affordable! Christmas is coming! The holidays are coming around quicker than you can say ‘candy cane’ and people are beginning to look forward to their Christmas antics, but are you? One factor might be stopping you from getting caught up in the excitable commotion is the expense. Christmas is undoubtedly the most expensive season of the year – and the most stressful! Before you step into the shops, make a list of everything you need to buy and a separate one for everything you’d like to buy. Prioritize buying what you need over buying what you’d like first to make sure your financial situation doesn’t hold you back from buying something you really need. If you have money left over, you can pick and choose the items on your ‘would like’ list. Actually tell people what you’d like to receive. Avoid the phrase “I don’t know” when people ask you what you’d like for Christmas. Although you’re just being polite, your friends and family want to return the favor of buying them gifts and buying you presents in exchange. Consider what you need, but can’t afford to buy, and what you’d like (usually, this will be an item you wouldn’t normally purchase yourself) so you don’t have to worry about purchasing what you need in the lull after Christmas. The earlier you begin to save, the less you’ll need to panic as the big day approaches. If you can’t start saving in January to recover from the previous month, you should start saving at least a couple of months in advance depending on what you plan on spending. Plan a day to go Christmas shopping and avoid hitting the shops again to avoid making impulse purchases. This also helps you reduce your carbon footprint, so it’s a win-win situation. Christmas lights are just one cause of increased energy bills over the Christmas period. Did you know? The estimated electricity cost for the standard Christmas tree with lights left turned on for at least 12 hours a day for 40 days costs a minimum of $10. You can save up to $9.73, just by switching to LED lights. Top tip: All of your Christmas tree and external Christmas lights should be on timers to avoid racking up a costly bill. If you forget to switch them off after a long day, no biggie! You won’t need to roll out of bed to turn them off. Year after year we panic buy at supermarkets because the shops will be closing… for a maximum of two to three days, so is there any need to overspend to stock up for our ‘what ifs’ and ‘buts’? No, there’s not. In 2015 it was revealed that more than 4.2 million Christmas dinners were wasted in the UK alone – including 740,000 slices of Christmas pudding, so it’s OK to put that extra pudding down. So, now you know how you can make Christmas more affordable, it’s time to start making your lists and checking them twice. There’s only more than three months to go! 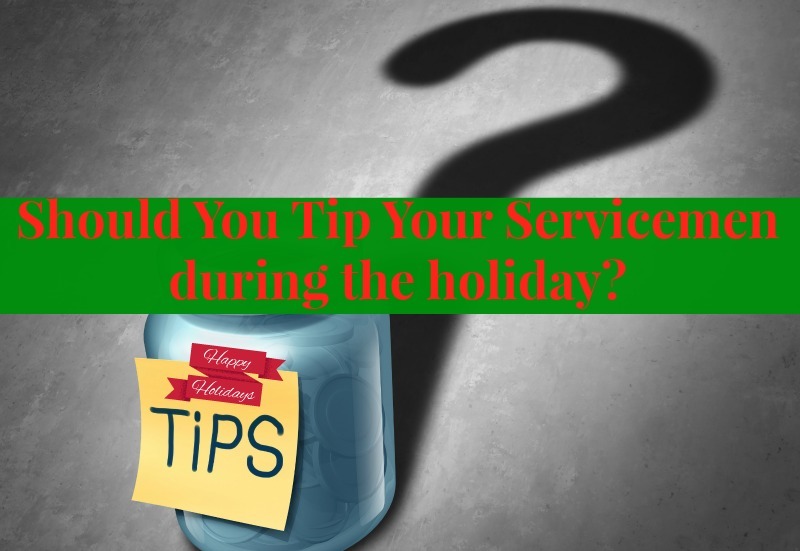 Should you tip your servicemen during the holiday? The Holiday season is ALL about giving, spending time with ones you love most, and being thankful for the life that we are living! I personally believe that you should give back to and help as many people as you possibly can because you never know what someone is going through and always remember that there is someone out there that is less fortunate than you. A really questionable topic that is often talked about is, whether or not we should be tipping the people that do everyday services for us, such as our landlords or mail men, trash people, etc.! Today I am going to be talking all about this topic and what I think about the matter! Some people say that we shouldn’t have to tip our service people for things that they would normally have to do for us anyway. I mean after all, that is their job, and they are getting paid to do it. It’s not as if they are a waiter at a restaurant where they are making less of an hourly wage and rely on their tips, this is a completely valid argument! I definitely disagree with this thinking! I think we absolutely should tip these people in our lives during the holiday season. These folks have to go through a whole lot of things for us! For example, your trash people and mail delivery person have to work throughout the winter season even through the freezing cold and snow and inclement weather, or your landlord has to come around when necessary to fix things and take care of problems for you! I order a ton of packages and things online, so the mailman is constantly busy at my home, and having quite a few people in our family creates a lot of trash for the trash man as well! I’m not suggesting that you tip them some crazy amount, but sliding them a little extra love for the holiday season, it will be much appreciated! After all, the holidays are all about giving back and being friendly with the world! I personally believe that tipping your servicemen will give you the great feeling of giving; it will help you to create a relationship with these service people, and they may just even give you a bit of a better service treatment when you need them next! So if you’ve never tipped these people in the past, try giving a little something special this year for the holidays! I always get so excited around the Holiday season! I mean it’s just such a happy, cheery, and fun time of the year! One of my personal favorite things to do around the holidays is to spend the whole night sipping on hot chocolate, watching a good movie, and decorating the Christmas tree with my family! Ever since the kids were little, we’ve always done this together, and it’s just such an amazing time that I cherish and look forward to every year. I personally love to make my tree look beautiful, like a work of art! I have seen a lot of crazy Christmas trees in my days, whether they be too bare and have not enough flair to them, or too busy with the ornaments all jam packed on there. Now, I know that decorating your Christmas tree isn’t about making it look perfect, but it is nice to have a beautifully decorated tree! If you have come across the issue of having a crazily decorated tree and you want something a bit more elegant, I am here to help! Today I will be sharing with you a few tips for getting the perfect balance of ornaments and decor on your tree! Select a Theme and Buy Matching Decor: I highly recommend choosing some sort of theme for your tree! Pick out ornaments and other decor that match that theme and your tree will look awesome and everything will coincide with each other! Completely Cover the Tree: One of the biggest mistakes people make are not covering their tree entirely! A lot of times people focus their decorations on the front of the three and don’t get things all the way around the tree. You definitely will not want to do that, make sure you have decorations all around your tree so you can see its beauty from all angles! 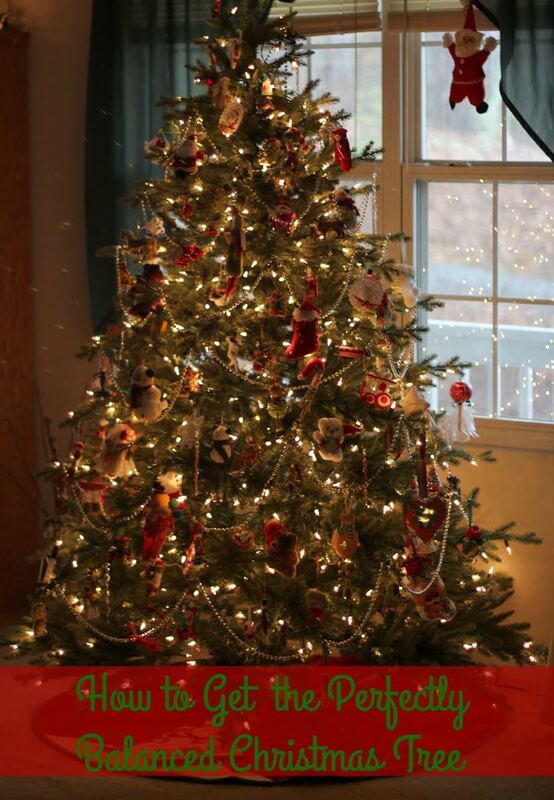 If you follow these tips and rules for decorating your tree, you will definitely have on beautiful work of art cupcake! I hope you all have a great time decorating your trees and be sure to make some fun and happy memories with your family as you. There are very few parents who haven’t heard those two inevitable words coming from their child during the holidays. Be prepared these school holidays for when your child/children utters the dreaded B-word by having a range of fun and simple activities up your sleeve. 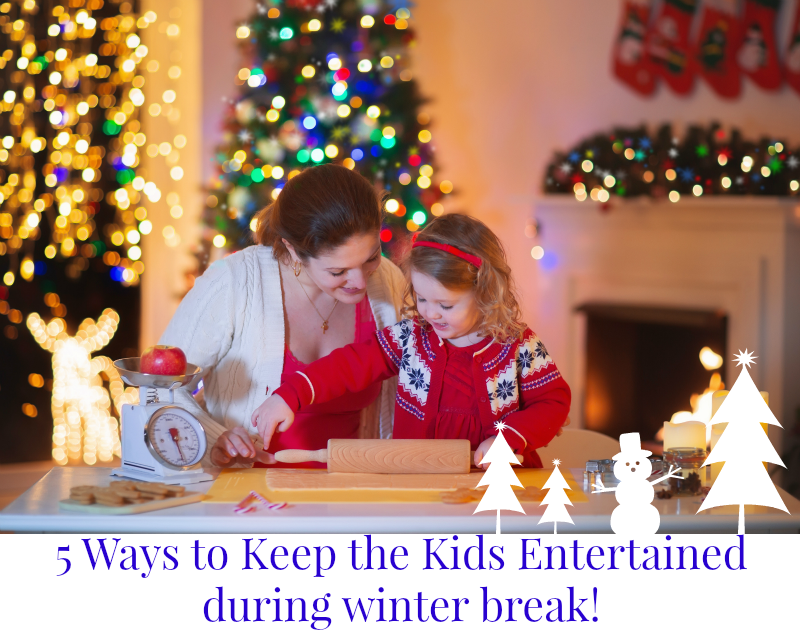 Here are five ways to keep your kids entertained. Teaching your kids to play sports is one of the best ways to keep them entertained while also keeping them fit and active. With so many different sports out there, every kid will have his or her own favourite so why not try them all? You can pick up some basic equipment from sporting stores like HART Sport and play a different game every week and see which one your kids enjoy the most. Who knows – you could end up creating a hobby for life. If your kids prefer creative exercise to physical exercise, why not get them into arts and crafts? It’s an easy and inexpensive way to keep them occupied while also sparking their imagination and motor skills. You can come up with your own craft ideas with things lying around the house or, if you get stuck for inspiration, scour the internet for crafty ideas you can get your kids involved in. Shh… they don’t have to know it wasn’t your idea! If your kids are old enough, why not get them to help you with some baking or cooking? The kids will love being assistant to the chef and can even help you decorate holiday-appropriate items such as Christmas cookies. Best of all, afterwards they get to eat what they helped to make! A world of fun and entertainment for your kids could be as close as your backyard. Set up a tent or two and invite their friends and neighbours over as they spend the night camping, telling ghost stories and eating marshmallows as they sleep under the stars. If weather conditions are less than optimal, or if you want to keep a closer eye on things, you can always move the tents indoors and create a slumber party instead. Your local swimming pool can offer hours of fun for little ones. You can relax with a good book as your kids splash around – or you may want to consider jumping in and having a frolic yourself. Many pools also have swimming lesson programs on offer if your kids are inexperienced in the water. Your kids will thank you, especially during the hot summer holidays. Let’s face it, it’s easy to plonk your kids in front of the TV to keep them busy but that can only go so far. By thinking of more creative ideas and getting them out of the house and active, you can make sure they keep entertained these school holidays. The only hard part will be convincing them to go back to school when it’s all over!